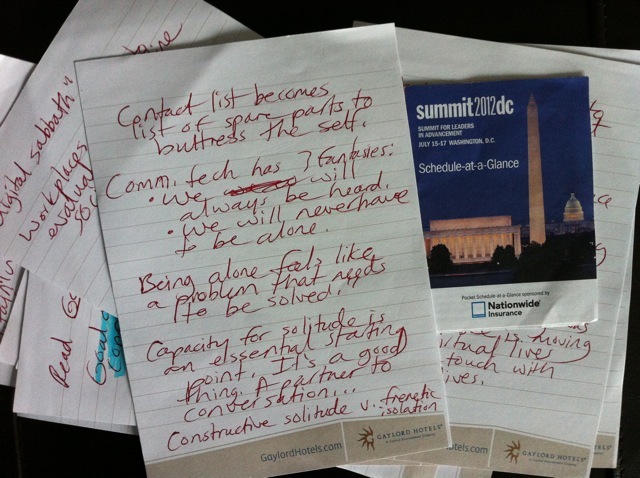 My handwritten notes, taken during Sherry Turkle’s talk. As the chief “figure-out-all-things-social-media” person and senior writer at Frostburg State University, I move back and forth between digital, written and spoken communications. It’s not uncommon for my day to include updating FSU’s social media accounts, interviewing a donor for a feature story and preparing a public presentation for our university president. Those of us working in higher ed often wear several different hats, and on our best days, we embrace the variety. But sometimes it can be confusing, particularly when it comes to communicating with people online versus reaching out to them in person. Are we increasingly unable to have meaningful conversations and be present in the moment? Are we in too many (digital) places at once? Sherry Turkle shed some light on these questions as part of “The Social Web: Relationships in the Digital Age” at the recent CASE SUMMIT for Leaders in Advancement in Washington, D.C. As the Abby Rockefeller Mauzé Professor of the Social Studies of Science and Technology at MIT, Turkle has written a slew of great articles and books that explore our social interaction with technology. She’s a self-described “partisan for conversation” (basically, someone who wants us to remember to put down our mobile devices, look each other in the eyes and really talk to one another, offline). She challenges us to consider how being plugged in 24/7 is undermining our ability to pay attention and pulling us away from self-reflection and engagement with others. (I couldn’t bring myself to live tweet highlights from her talk on my iPhone and opted for jotting down ideas on my hotel notepad instead!) Following her remarks, she participated in a panel with Charlie Melichar, associate vice chancellor, communications office at Vanderbilt University, and Scott Westerman, associate vice president and executive director of the alumni association at Michigan State University. Are you a partisan of conversation when curating and creating social media content for your university? For example, do you ask people questions about their experiences at your institution or do you simply push out press releases on Facebook? Conversations aren’t one-sided; they’re dynamic and full of humor, emotion and faux pas. They aren’t always glowing recommendations for our schools (here are some strategies to help you respond to Internet trolls and naysayers) but they sometimes lead to magic moments, like a proud alum sharing a picture of how she got engaged at her favorite spot on campus. Don’t forget to listen to and encourage these interactions as they all tie back to meaningful, in-person memories and connections people have with our schools. During the panel, Melichar said he’s built time in his day to write handwritten thank-you notes, which are definitely more personal than a pithy email. Stepping away from our computers to write words down also encourages us to think about how we know people and how we care about their connections to our schools, without status updates and Inboxes robbing us of that time to reflect. Turkle talked about how in the future, schools will probably offer classes on “uni-tasking” (as opposed to multi-tasking) because students will have lost their ability to focus. This led me to wonder: are our institutions offering relevant courses on digital literacy and balancing online interactions with in-person ones? As higher ed professionals, how can we cultivate more specific concentration and less frenetic multi-tasking?